The second semi final of the Torneo Virgen Blanco was significantly better attended than the first, in which only about 500 of 2155 seats were filled. Friday, in contrast, brought a near full house of enthusiastic fans who appeared torn in terms of allegiance between the master Titin and ‘Pablito’ Berasaluze, the terrier from Berriz. In the final analysis, it was the fans of the latter who left satisfied; Berasaluze produced a trademark performance of tenacity and drive, belying once again his small stature. Titin looked a shadow of the man we know he can be and it was only when the victory was as good as in the bag for the Asegarce pair that he showed any kind of convincing fight. Berasaluze in contrast chanced his arm and succeeded, bringing off some stunning hooks and returning everything his opponents could throw at him. In defence, Inigo Pascual seemed oddly off colour and never truly found his range. 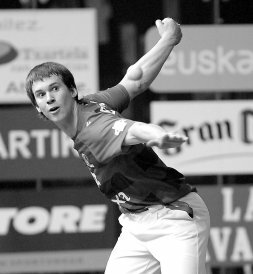 Oier Mendizabal, conversely, was at his metronomic best, the perfect bedrock for the attacking instinct of his partner. The Asegarce victory here means that the final will be an inter-empresa affair; Berasaluze and Mendizabal will play Xala and Goni III of ASPE for the Virgen Blanco crown on Sunday. Catch it on ETB-Sat at 17:55 (CEST).